Feeling lost in life is an awful feeling and the feeling can come along at any stage in life, whether your young or old. Feeling lost in life is one thing, but bottling that feeling up can be even worse. It can lead us to losing motivation in the things that we once loved. With the negative thoughts it’s easy to let them spiral, leaving you feeling hopeless about the future. This type of feeling, alongside the feeling of being lonely, are what I wouldn never wish on anybody; not even my worst enemy. There’s nothing worse than not knowing where you want to go in life and being unsure on where your life is leading you. It’s a very confusing time with a lot of figuring out to do. What doesn’t help is when there are expectations from people around you. Feeling lost in the direction of your life is one thing, but having an unnecessary pressure from others to have a vague idea of where you want to go in life makes it ten times worse. You can my post on pressure and expectations for more on this, I don’t want this post to get too long. The pressure does make you feel worse than what you’re already feeling, on top of the pressure from yourself to find some sort of direction in your own life. The added pressure from others only acts as a hindrance. It’s okay to feel lost. Dealing with feeling lost in life isn’t easy, it’s an experience that will shape you and make you stronger as a person. In the end, it will be worth it. To ease the feeling I have a few tips. • Talk to someone about how you’re feeling. Any good person will understand once you explain and open up to them, whether that be a family member, a close friend or someone at work. Absolutely anyone. Talking about your feelings might be the hardest part, but as they say a problem shares is a problem halved. • Keep yourself busy, whether that be through work or hobbies. By keeping your mind occupied by something else, hopefully the feeling will have less time to consume your energy and thoughts. • Exercise. Exercising is a win-win situation for you. Not only is it healthy for your body but it’s healthy for your mind too. Maybe set yourself a little routine and exercise at a similar time each day. 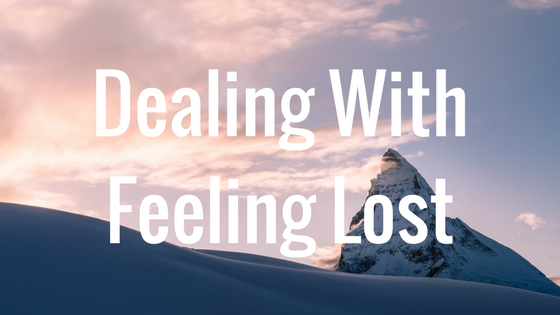 Have you got any suggestions for dealing with feeling lost? Let others know in the comments! This genuinely could not have come at a better time. This is accurate to how I feel lately. I usually just put a smile on my face or try to brush it off, but I couldn’t do it today. You’re spot on when you say you know exactly where you want to be but no clue how to get there, or if you’re making the right choices. Feel lost and restless.. and knackered! Anyway, sorry for the whinge! I read this and it really resonated with me. It’s how I’m feeling at the moment too, but it’s okay. I’m just trying to accept it!